Do you believe in fairy tales? I do. And if you spend just a week in Ireland, you might, too. In the first week of June, I embarked on my very first trip abroad, to Westport, County Mayo, a town of about 6,000 people at the edge of an Atlantic inlet in western Ireland. For seven days, I traveled the Wild Atlantic Way along with nine Flying Longhorns. I had only left the United States once before—14 years ago, when I went a few miles from my hometown of McAllen, Texas, to Reynosa, Mexico. As my plane left the New York asphalt behind and set out for Ireland, I closed my eyes and waited to be taken to a world unlike my own, hoping to find a little magic. And I did, around every corner. In the way that your eyes seem more open as you travel, even the scenes we passed on the bus ride into town all had a touch of whimsy. On that quiet morning, I saw a couple touching up the white paint on their window shutters, an older man in a red shirt smoking a cigarette on his front stoop, a gaggle of teenage boys hanging outside a gas station, school kids in their uniforms walking down the street, and light brown cows lying in the grass, taking a moment. 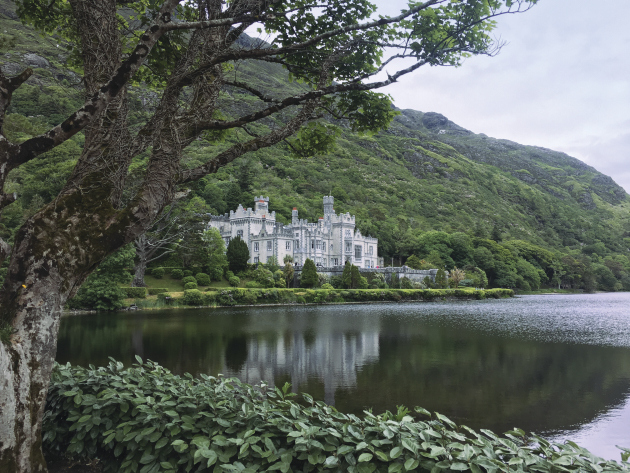 Those quaint scenes were juxtaposed with magic and myth: a stoic castle in Kinvara, the humbling cliffs of Achill Island, and the enticing black waters of Connemara. The quote comes from Yeats’ play, The Land of Heart’s Desire, about a fairy child who meets two newlyweds, and attempts to persuade the newly wed woman Maire to return with her to the land of fairy. I had no idea that in a matter of hours, I would step into the land of fairy myself. After the Yeats Memorial, we ventured out to the green pastures of Carrowmore Megalthic Cemetery. The cemetery is Ireland’s largest Stone Age burial site, with 30 tombs more than 5,000 years old. Covered by an arrangement of large stones, most tombs contain approximately 30 bodies of the ancient Irish, including men, women, children, and, rather bizarrely, deer heads. It isn’t known why exactly these bodies were placed in the tombs. Researchers theorize the burial sites were part of a pagan ritual, as the ancient Irish were highly religious people. The central tomb, the largest of them all, was unlike the majority of the others in that you had to step into a large fort-like structure made of stones to get to the dolmen, a megalithic tomb with a large flat stone laid on upright ones. Before we crossed the barrier, our guide warned us that we would be entering the Land of the Dead—“or the land of fairy, it’s all the same,” he said. And without hesitation, we did. We learned that the tomb we were standing in was the only one that had been proven to be astronomically aligned. On Samhain, a Gaelic festival marking the end of the harvest season and the beginning of winter or the “darker half” of the year, the sun rises in line with the chamber, illuminating the structure in a blanket of gold. Throughout the trip, I kept a sharp eye out in hopes that if I strayed from the group, I’d see something phantasmagoric. Standing on the edge of the cliff on Achill Island, surrounded by glittering gold rock, the bluest ocean I have ever seen, and nothing man-made in sight, I could envision pirate ships coming for us on the horizon. We visited the Westport House, a parkland estate from the 18th century that was built by descendants of the Pirate Queen of Connaught Grace O’Malley. The manor, surrounded by acres of greenery, was the perfect place to explore. I let myself get lost, following a small river to a bright red bridge, hoping I’d meet a fairy on the other side. And as I made my way through the gardens of Kylemore Abbey in Connemara, coming upon brightly colored and ornate entrances to places that seemed crafted just for me, I peeked into the trees, hoping that every rustled leaf meant a mythical creature was waiting to say hello. At this point, I probably sound crazy. But I’m someone who grew up reading the Brothers Grimm, Neil Gaiman, and any other dark fairy tales I could get my hands on. And I am always in search of places that allow my imagination to run wild. Ireland is just that. Its weather is not always kind, but the air feels fresh and clean. The landscape is savage, but breathtaking. You can’t help but wonder if waking up to it every day ever gets old. Ireland is land that allows its people to inhabit it, but still remains untamed. Parting ways with Ireland and the people I had just spent the last week getting to know admittedly left me sad. Before my plane had even taken off, I was already nostalgic for the traditional Irish songs, with their melodic flutes, that had me tearing up in a pub; the Irish coffees that could be had in any restaurant; and the greenery that made me consider never living in a city again. Now, I sit here patiently, with the seeds of native flowers I brought back growing on my balcony, the rock from the Land of the Dead in my wallet, and my book of Yeats’ fairy tales on my mantle, waiting for fairies to take me from this dull world, so that I might return to Ireland once again and dance upon the mountains like a flame.